CEE was invited by State Ecotourism Agency - Uttar Pradesh Forest Corporation (UPFC) to organize bird awareness and education activities at ‘UP Bird Festival’, initiated by The Government of Uttar Pradesh, from 4-6 December 2015 at Jarar, Chambal, Agra. Uttar Pradesh is known for its rich biodiversity and is home to over 800 species of birds where 45 of these are globally threatened species. This festival is aimed at popuarizing bird sighting locations as well as creating awareness among people for conservation of birds and their habitats. The festival had presence of over 100 international and national level ornithologists, photographers, birding enthusiasts, and wildlife artists. Apart from this there was visit of local school, colleges, institutions and state level nature and wildlife conservation agencies. The Chief Minister of Uttar Pradesh Shri Akhilesh Yadav inaugurated the event and addressed the participants. 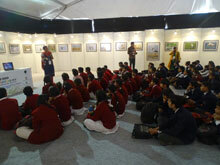 Over 350 school students from Agra, Chambal, Etawah and nearby areas attended the festival. 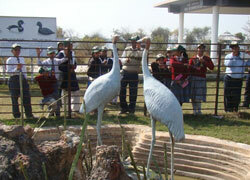 CEE facilitated orientation session on knowing birds, visit to bird exhibition, expert lecture, competitions, games etc. 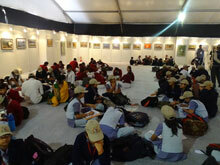 The activities involved participation in quiz, essay and poster making competitions. Winners were awarded by Senior Forest officials. Mr. Akhilesh Yadav interacted with CEE team at the stall wherein CEE exhibited their work and educational material. Mr. Sanjeev Saran, Principal Secretary Environment, UP Government also appreciated CEE for closely working with UP Government on several environment education related projects. 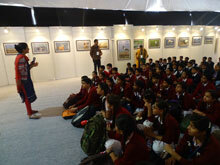 The Prakriti Bus was also stationed at bird festival raising awareness of visitors and participants about the rich biodiversity of Uttar Pradesh. CEE has been working in the state of Uttar Pradesh (UP) since 1995. The focus of CEE's work in the state has been environment education in schools, water, health and sanitation, natural resource management, solid waste management and awareness generation. The Department of Education, State Council of Education Research and Training (SCERT), State Institute of Education (SIE), Directorate of Environment (DoE), UP Forest Department, Tribal Cooperative Marketing Development Federation of India Ltd (TRIFED), WWF, Science Centre and Club and more than 30 partner NGOs, etc are the agencies with which CEE has been working in the state. Facilitating NGC as a Resource Agency in all 70 districts of the state, with activities spread across 10,500 schools. Organized training programmes for 118 master trainers from the state and 30 district level training workshop for teachers-in-charge. Conducted school level events and activities on environment related days. Implementing MoEF supported “Ganges river dolphin – Conservation Education Programme” along Ganges and Brahmaputra rivers and its tributaries. Implementing Children Forest Programme in 100 schools of Lucknow with the support from UP Forest Department. Implementing Paryavaran Mitra programme through a network of partner agencies and institutions in more than 16-18 districts. Organizing school events like competitions, guest lectures, exhibitions etc., on the occasion of World Heritage Day, World Environment Day, International Ozone Layer Protection Day, and other environmental days. Act as a nodal point for Regional Centres of Expertise (RCE) programme and has been acknowledged as RCE Lucknow with the network of higher education institution. Developed Training Modules on Safe School Environment and Health Promoting Schools for SCERT, UP. Developed EE programmes and educational material in English and Hindi for water and river related issues especially for Ganga and Gomti rivers. Natural resource management for promoting biodiversity conservation and sustainable livelihood for indigenous tharu tribe in Dudhwa National Park. UP Forestry’s Eco Development project with UP Forest Department for preparation and implementation of eco-development micro-plans for 83 villages in and around Protected Areas in UP. Developed exhibitions on Sustainable Agriculture showcased at Pragati Maidan, Delhi and on Science, Technology and Environment displayed in various schools and fares etc. Developed a resource book on NRM with UNESCO titled “One Sun Two Worlds – An Ecological Journey”, in English and Hindi. The resource book is in dialogue form between Formal Knowledge and Traditional Ecological Knowledge on natural resource management and sustainable development. Developed the Hindi version of UNESCO’s Environment Education Kit on Desertification, which includes teachers’ guide, case study series, cartoon book and poster. Developed three resource books on EE for NCTE in Hindi for teacher educators. Lucknow is the study centre for the Green Teacher – Diploma in Environmental Education, a one-year distance education programme for middle-school teachers. Provided academic support to SCERT UP in organizing State level training programmes for master trainers from 70 DIETs of UP on Safety, Sanitation, Health and Overall wellbeing. During the year 1994 to 2006, publishing and disseminating Sampark – the Hindi version of UNESCO’s quarterly newsletter Connect – to organizations, institutions and individuals. Organized four Public Hearings, eight paryavaran panchayats and two workshops on media and environment. Organized environmental law capacity building programme for judiciary in the state, to promote environmental justice and provide a framework for resolving environmental conflicts within the context of the environmental laws and regulations. Implementing a Solid Waste Management programme in residential colonies of Lucknow through community participation.